No blogs this week on account of an accident on the staircase this morning. I was carrying my 18-month son down for his morning milk when I slipped and slid on my back all the way down to the ground floor. Soren is fine, thankfully – I held him tightly to my chest – but I’ve taken quite a few hits on my back and scraped my left elbow. I seem to have escaped serious injury, but I have to go to the hospital just to make sure. Have you played in other online worlds, and if so what were you playing before you came to Minecraft? How did you come to change from the previous game to Minecraft? Do you feel a sense of community with your fellow Minecraft players, and if so how does it manifest? Do you play at the same time, or at different times? How do you communicate with other players? What are the best aspects of playing Minecraft multiplayer instead of solo? What makes it worthwhile? What are the worst aspects of multiplayer Minecraft? What do you wish you could change, or what irritates you about playing Minecraft with other players? This post collects some variant rules, resources and strategic advice for Fantasy Flight’s Arkham Horror board game. All content presented here is unofficial. Above is the “Dimensional Tracker” card for use with Arkham Horror. You can download a print-ready version of the Dimensional Tracker (2630.1K) image by clicking on the link. This card does not change the rules of play, but makes it easier for players to follow the narrative implications of the gates in play, and for new players to keep track of monster movement and the effects of gates closing. 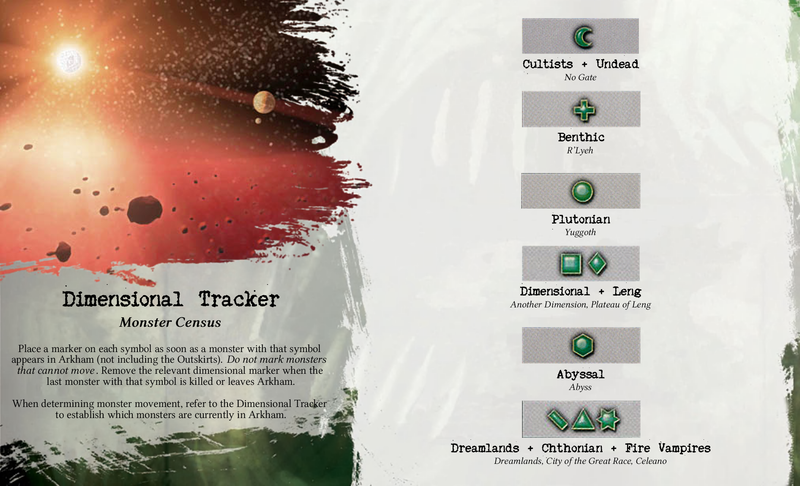 Every time a monster appears in Arkham, place a counter on its relevant dimensional symbol on the tracker (unless there is already a counter there). You do not need to track those monsters that don’t move (yellow border). Whenever a Mythos card is drawn, two sets of monsters will move – either the first two, the middle two, or the bottom two sets listed on the card. Simply refer to the card to determine if there are monsters in town to move – if there are no counters on those dimensional symbols, no movement is required. Except for special Mythos cards, if one symbol of the pair moves on white, the other moves on black. (It doesn’t hurt to periodically check who is in town, just in case the tracker is wrong). Hence the first player has the option to read out (on a relevant Mythos card): “Plutonians move on white, so Dimensional and Leng move on black”. Once the titles for monster-types are learned, this adds a more narrative slant to the movement of monsters. Remember that every time a gate is closed, all the monsters with that dimensional symbol leave Arkham. Therefore, after closing or sealing a gate, check the Dimensional Tracker to see if there are any monsters to remove from town. Then also remove any yellow bordered monsters with that symbol, and any monsters in the outskirts with that symbol. Beginner: at the start of the game, place an Elder Sign token at The Witch House and Independence Square. Only four additional Elder Signs are required to win. Novice: at the start of the game, place an Elder Sign token at The Witch House. Only five additional Elder Signs are required to win. Also, it is recommended for inexperienced players to try to play with at least four investigators, since the game is substantially harder with only one or two investigators. If there aren’t enough players, consider giving multiple investigators to each player. New players of Arkham Horror tend to see getting Devoured (losing your investigator and getting a new one) as the worst thing that can happen. In fact, getting Cursed can be far worse than being Devoured and new players should try to see the upside to being Devoured. When an investigator is Devoured, you (as the player) still get to keep all the trophies accumulated by that investigator – both gates and monster trophies. You only lose the investigator and all their all equipment – but you can choose a new investigator who starts with all-new kit. Whenever you have an investigator who is badly set up, crippled by permanent effects, or who just can’t work in the current configuration of the game, look for a way to get them Devoured. (This is, frankly, very much in the spirit of an H.P. Lovecraft story.) You will then be able to replace them with a new investigator, and you can choose the investigator whose ability is best suited to the current situation in the game. This is a simple house rule that will lead to more enjoyable games of Arkham Horror for many players. Because of the huge volume of random factors involved in setting up a game of Arkham Horror, it is possible for the investigators to start with a very awkward initial configuration – one that might not be much fun to pursue. To defend against this, and to allow investigators a better chance of beginning with cards that suit their identity and nature, after drawing “Random Possessions”, each investigator can be allowed a veto of one such randomly drawn cards. Common Items, Unique Items, Spells, Skills and Allies can all be vetoed in this way – but only if they were drawn as random possessions. Each investigator only gets one such veto, and it can only be used before the first turn of the game has begun. This is a variant that extends the basic game so that winning investigators can continue on to play against a new Ancient One. The Servitor and Master variant is best suited to those players who are proficient with the basic game and would like a chance to take successful investigators out for a second spin with everything they have accumulated so far. The basic format is that two Ancient Ones are assigned for each game – the Servitor (which must be fought first) and the Master (which is fought only if the Servitor is defeated). Players may either randomly select two Ancient Ones, and then decide which is the Servitor, or divide their Ancient One cards into two piles (one for Servitors and one for Masters), or simply play one Ancient One and then play another, according to whatever selection criterion they prefer. Remove all Gates, Elder Signs, Monsters, Mythos Cards and expansion-specific tokens from the board. Restore the Sanity and Stamina of all investigators. Any investigator in an Other World location, St. Mary’s Hospital or Arkham Asylum has the option to return to their Home location. Turn all Gate trophies face downwards. These do not count towards the victory conditions for “Closing All Gates” when fighting the Master Ancient One, but otherwise function as normal Gate trophies. The players may collectively spend 2 Clue Tokens, 5 points of monster trophy toughness, or a Gate trophy to lower the Terror Level by one. They may do this as many times as they wish, and the costs can be split between investigators (e.g. one investigator could provide 2 toughness and another 3 toughness). Each time they do so, the appropriate number of Allies that have left town are returned to the Ally deck e.g. in the basic game, one Ally returns for each point the Terror Level is lowered. Lowering the Terror Level in this way will also cause the relevant shops to reopen. After completing these five steps, the investigators are ready to face the Master Ancient One. In the second leg, note that anything returned to the box after use (e.g. Elder Signs) will not be available. Thus players have only four Elder Signs to use to defeat both Ancient Ones. Are you an Arkham Horror player? Feel free to leave your thoughts on these rules in the comments. My infinite thanks to Christopher G. Jennings for the Strange Aeons tool used to create the Dimensional Tracker graphics. The wonderful Anna Farmery invited me for a podcast, which went live earlier this week on her site The Engaging Brand. I’m afraid the podcast is in lieu of a new post this week as I’m thoroughly swamped.